Day 1: The hiking party consisted of myself (Matt), Mike, Tom, Gus and the rookie Dan (this was his first hike). Mike and myself started the day early with Mike picking me up at 04:00. We were to meet the rest of the party at Didima camp in the Cathedral area. After signing the mountain register we began the hike at 08:30. Our route to get to the contour path was via Tryme Ridge, which meant we had to first climb Tryme Hill. This is a very steep, and as the name says, quite a tiring climb. We had a quick break at the top of the hill and then it was on to the contour path along the top of the ridge. This is a nice gentle walk and a nice way to cool down from the climb. The weather was hot but the escarpment was still hidden by a massive bank of mist, which was to plague us most of the hike, as we climbed higher. Once we reached the contour path we filled up with water and headed south to reach the path leading to the old fire look out station. The contour path along this stretch is quite over grown but there is lots of water points. Tom , Gus and Dan were suffering a bit as they had had quite a party the night before and and that was coming back to bite them. Mike had done his training for this hike by stepping and was in great form. Once you get to the base of the climb to the old fire look out and the start of Organ Pipes pass you are faced with quite a big climb to the look out station. There are 3 large ‘steps’ that you have to ascend, with some of the group finding this last push quite tough. The look out station is very dilapidated and has suffered quite a lot of vandalism. There is only a partial roof, many of the windows are missing and there is no door, but the walls still supply good shelter from the wind which is fortunate because later that night it was very windy, with some very powerful gusts of wind. We ended up pitching our tents inside the look out station, and because the floor is level I had a very good nights sleep. We were fortunate to have clear weather that evening, and I managed to get some nice photos. Day 2: Our group woke up at 05:00 and were disappointed to find that we were in the mist. This mist was to stay with us for the next 2 days meaning that we were not going to have the wonderful views that you hike so hard to experience. From the look out station it is about a 3-4 hour hike up Organ pipes pass to get to the top of the pass. We made one little mistake when we took a wrong turn and ended up on the path to Thuthumi Pass, but we quickly corrected this mistake. Organs Pipes Pass is relatively speaking quite easy, with the odd section a little bit tricky, as the rocks were wet and the upper river crossings very slick. 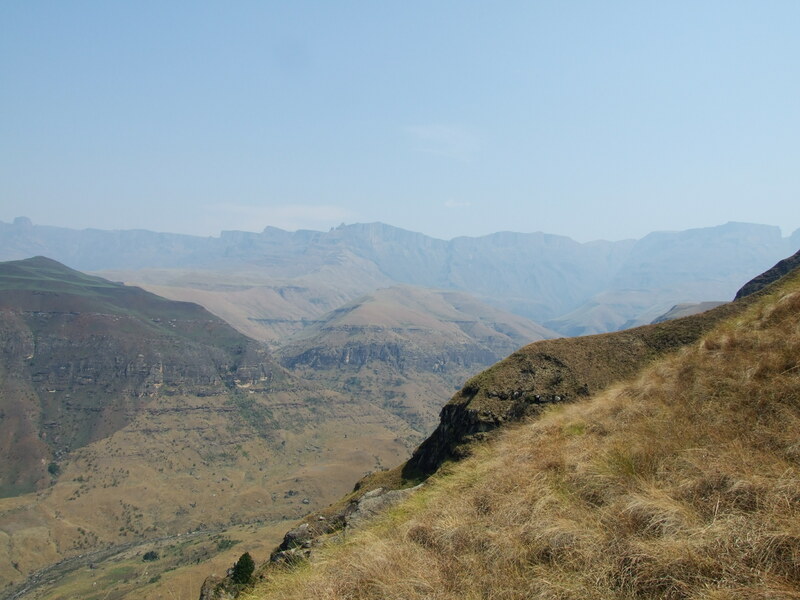 But as passes in the Drakensberg go an easy way to get to the top of the escarpment. It was at this point that we met another group of hikers and one of the most unpleasant experiences in my hiking career occurred. These 3 guys had read in the mountain register that we were planning to stay in Rolland’s Cave on the second night, but they decided that they did not care and would I guess push us out of the cave. 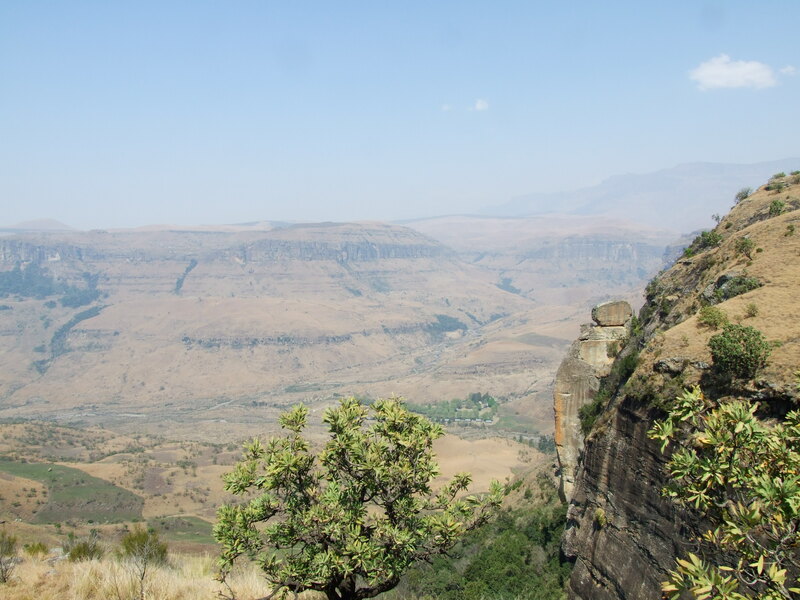 You are not able to book the cave as it is in Lesotho and therefore KZN Wildlife has no jurisdiction over the cave. Theses guys knew this but this tried to play the card that they had booked the cave. They lied to us to try to get us to give up the cave. I however knew that you are not able to book this cave and there was an argument. Besides their dishonesty they were also hiking without tents. This factor eventually meant that they had to use the cave as the weather was wet and misty and we had tents and so could deal with this but they could not. So we gave up the cave for their safety. I would like to add that this is not in the spirit of the mountains and hiking and if any of that group reads this report I would like to say, shame on you, I hope that this is not the usual way you conduct yourselves. We were however quite fortunate to find a pleasant camping spot that was well sheltered and close to water. We erected our tents and despite the weather had a good time. By this stage the guys had recovered and spirits very high. Although the camp site was a good one the ground was very uneven and getting a good nights sleep was impossible. Views were limited as the the mist was quite thick so the conditions were not ideal. 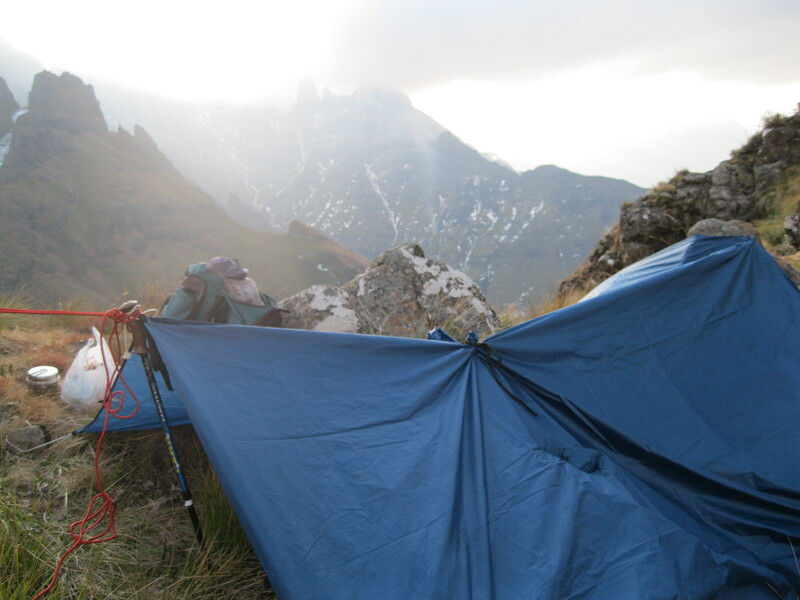 Day 3: We again had an early start which was a good thing as we had to make it all the way back to Didima Camp. The early morning was the clearest that we had seen since getting to the top of the escarpment but this was not to last as the mist started to roll in again. We were due to descend via the Camel path but to my great disappointment we descended the Organ Pipe Path due the thick mist. This was quite easy even in the mist but it is quite a long, if not steep, pass which can get a bit tiring. Gus was in great form and kept leaving the rest of us in his dust. Once we reached the contour path we continued on to Mike’s Pass having lunch at the top of the pass. One last push down the pass and we arrived back at Didima camp, where we drank a couple of cold beers to celebrate a successful hike. I have found that is is advisable to split your climb to the top of the escarpment into 2 days, to maximise your enjoyment of the hike. 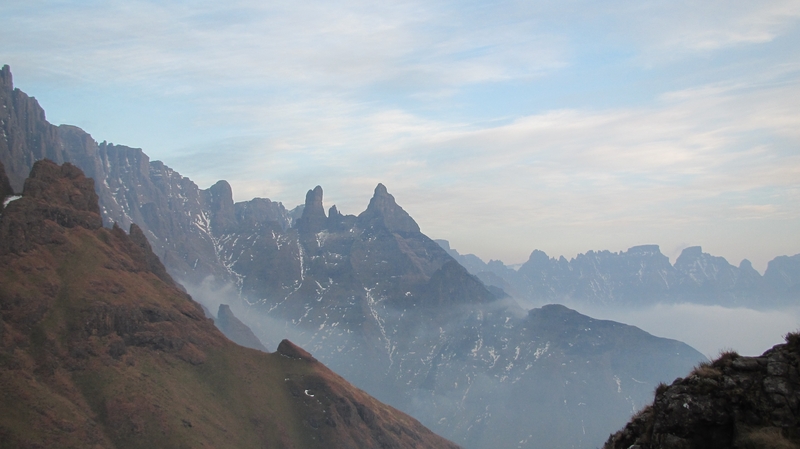 It is possible to reach the top in 1 day but that is a huge physical effort, which can take away from the social enjoyment of a hike. On Friday 17 August 2012 Matthew and I headed up to Cathedral Peak to Do a hike to Roland’s Cave and then on to Schoongezhigt Cave. Leaving Durban at 5am we travelled up to the berg stopping off at Mooiriver for a break, where I had a Cornish Pasty from the garage. When we got to the camp it was cloudy and Matt was doubting the decision to go on this hike. We eventually left at around 9:45 and headed up the path from the car park past Ribbon Falls. We stopped for lunch at the top of the little berg next to a stream. At around 12:30 we started to make our way up to the Camel (alt 2500m), on the way to the contour path I could feel some cramping beginning, not a good sign. The Camel is not a bad walk and the path quite easy, my conditioning for the hike was not what it should be as usual. We saw the first bits of snow left over from the big snow fall about halfway up the pass. The higher we walked the less energy I had, the harder it became. We eventually got to a point above the Camel where we hit a ledge with hardened snow that we could not safely pass. Turning back to go and free camp on the camel with no tent I felt a bit of relief that we did not do the last bit as it did not look easy and my condition was deterioration fast. Apparently sitting in from of a computer all day is not good training for walking in the mountains!! Dinner was cold baby potatoes and a tin of Salmon. Listening to the radio that night the program was talking about loosing weight, and during the hike that day it was decided that I need to loose weight and get fit before attempting any further adventures to the high berg. One of the suggestions from the guy on the radio was to stop eating garage pies!! Matt and I had a goo laugh!! Mentally beaten from the previous day I decided to head to Schoongezhigt Cave via the contour path and down Philips Folly. We descended to the contour path and hiked the 12 odd km to the cave. I was a pleasant walk until heading down Philips Folly where my lack of fitness really hurt me. It took 1 hour to descend to the bottom. On the way to finding the cave Matt noticed a fresh footprint, and we though there might already be people in the cave. Arriving at the cave at about 3pm is was empty and there was no sign of anyone. I managed a little splash bath and Matt stayed dirty. We decided to make dinner early, tinned meatballs and pasta. Thankfully that was not the most exciting thing to happen that evening. 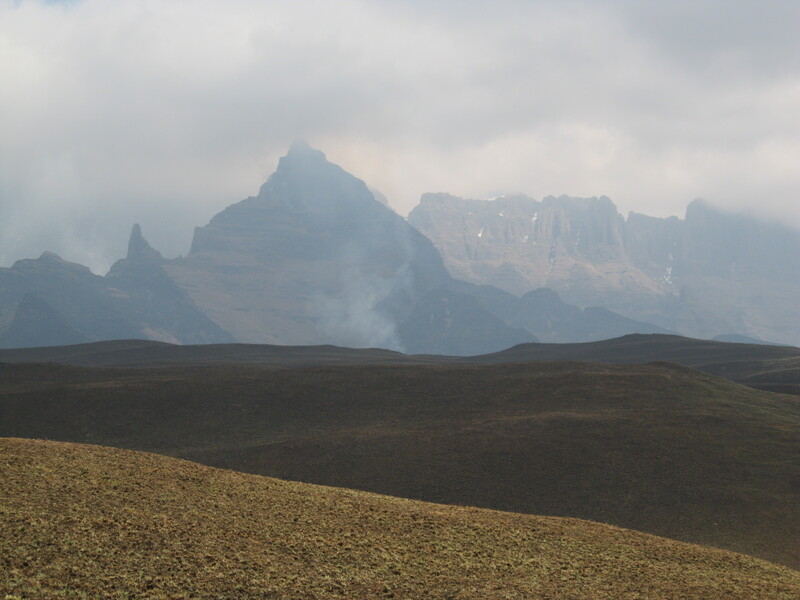 At around 4:30 we saw a group of Basotho’s coming down the mountain with sacks of dagga on their backs. We then heard a helicopter flying up the valley and then things got interesting. The police then started to appear from everywhere, some only about 20m from where we were standing watching the whole thing go down. There were warning shots fired and three of them got away. We did not here anything from the police and decided that the best thing to do was to stay put. Eventually in the darkness the police came by our cave and asked if they could spend the night in the cave with the suspects and the haul of dagga. Thankfully I was so tired I managed to sleep through all the talking and noise around the fire that night. The next morning we made an early start and headed up Philips Folly, I was not looking forward to walking up the hill. Suprisingly it only took one hour to climb the hill, the same amount of time walking down. We then walked to the top of Mike’s Pass and then managed to get a lift to the bottom with the Police, saving my life. We then had to walk a further 5km to the car but thankfully we managed to get another lift to car, again saving my life. We then got cleaned up and had a beer at Didima and headed home. All in all an interesting hike covering around 30km and ascending 1500m and descending 1300m. We (Mike, Tracy and Bianca) departed Durban on Saturday morning at around 5:30am and arrived at eNjesuti at about 9:30. 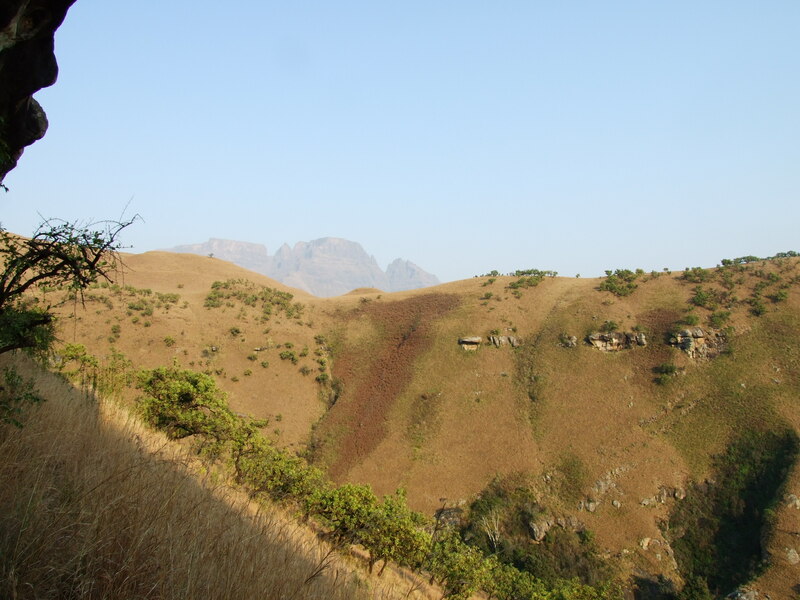 It was my first hike in a while, and not being very fit at all we took a slow walk to the top of van Heyningen’s Pass where we had a snack and a break..
We then headed up the hill and over to the cave. You know you are unfit when you arrive at the cave after walking only 10km or so and are exhausted!!! That afternoon had a nice swim in the pool and a bit of a afternoon sleep. The next morning we headed back the same way. On the way back we discovered an amazing view point just a few meters off the path, just before you turn left to go down the pass. Unfortunately the pictures did not come out that well due to the haze in the air. We named it “Wimpy Point” as all we talked about was having a burger while enjoying the view. Got back to Durban in the late afternoon, and yes we had a Wimpy burger at Mooi River on the way home. All in all a very pleasant hike.